In 138 AD, the roman consul Decimus Junius Brutus Callaicus rewarded his troops who had been fighting in the Portuguese countryside with land in eastern Spain. Some 2000 settlers found themselves in a natural ford belonging to the River Turia where the Augustan Road passed by. This settlement was called Valentia Edetanorum (courage in the region of Edetania). Although proof exists that the Iberians were present in Valencia at the end of the IV century AD, the roman colony were the first to settle permanently, and shaped the city forever. Later, the Visigoths arrived, then came the splendour of the Balensiya muslims, and finally the reconquest of Jaume I of Aragón. In the 14th century, a new wall was devised with two objectives: to include the small core population that had grown outwith the town, and to protect the city from the King of Castile’s attacks. 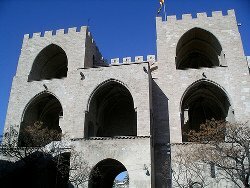 This serves as a brief introduction to the city centre of Valencia: the wall that was built in the 14th century is that which defines the Ciutat Vella (Old Town) area, the centre of Valencia in its widest sense, and the boundaries of the Roman settlement meet the neighbourhood of La Seu, centre of political and religious life within the Valencian community. And so, the district of Ciutat Vella, divided into six neighourhoods, is defined by Calles Colón, Játiva, and Guillén de Castro, and by the right bank of the river. The centre is one of the most exclusive areas in Valencia, hosting a mix of history and modernity that cannot be found anywhere else in the city. In Ciutat Vella, you are likely to find as many of the most luxurious buildings as the most bohemian streets. It has the most prestigious shops while at the same time the most traditional and artesan, together with the comforts of the large department stores. The majority of museums in Valencia belong to this area. Taking a walk to the centre involves passing a multitude of historical buildings and monuments; testimonies to the passage of time and the different cultures that have formed the character of the city. 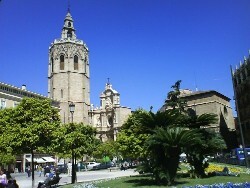 Let’s start with the Plaza del Ayuntamiento: this triangular plaza is the headquarters for the City Council. The whole plaza is shaped by buildings of outstanding architectural style, most of which were constructed during the early 20th century. In front of the Council building is a large open space of neoclassic design, surrounded by traditional flower displays. Between the 1st and 19th of March it is in this space that the spectacular mascletà, one of the biggest events of the Fallas festival, is carried out. During the Christmas celebration the plaza is decorated, and special lights and flowers are installed for Easter. It is impossible to deny the variety of shops in the centre of Valencia. Department stores can be found in Calles Pintor Sorolla and Colón, right in the heart of Centro. There are shopping centres in Don Juan de Austria, the most exclusive shops in Poeta Querol, fashion boutiques in Colón and the surrounding area, innovation and design businesses in Barrio del Carmen, as well as the small artesan and traditional shops that are scattered througout the centre…an abundance of premises. The area is epitomised by its variety. With regards to restaurants, the diversity is also outstanding: restaurants for families, restaurants with gourmet food, specialising in rice, exotic, signature food, innovative, specialising in seafood, all types of fast food…the list goes on. As much for a quick bite as for a special evening, the centre is the place to eat in Valencia. In the same way, when going out for a drink, the selection is endless. If Spain stands out in Europe for its nightlife and festivities, Valencia stands out in Spain for the same reason. It does have to be said that limitations on hours of business and licences that have been established in the past few years have reduced nightlife, at least in the street. However, those who go for a drink at night will be surprised by the number of bars and pubs and, just as with the shops and restaurants, the variety is phenomenal: from traditional pubs to elegant cocktail bars, there is something at every end of the spectrum. There is also a great deal of culture present in the centre. Cinemas, theatres, galleries, museums, and libraries can be found with relative ease. The Lys and ABC Park cinemas are now legendary for Valencianos and both have been renovated in recent years. 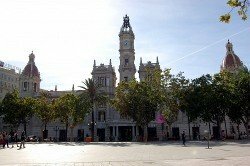 The Filmoteca, in the aforementioned Plaza del Ayuntamiento, shows seasons of classic and culturally remarkable films with three showings per day, and the Realto theatre is located in the same building. Very close to this, there are other important theatres such as the Principal or the Olympia, and without even leaving the Ciutat Vella, one can visit the Escalante or the Talía. 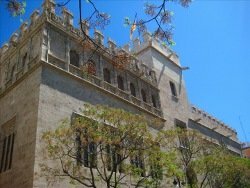 The majority of museums in Valencia are also found here: the IVAM (modern art), the MUVIM (Enlightenment and modernity), the Ceramic Museum, the former site of the University of Valencia, The Chirivella Soriano Foundation, the Prehistoric Museum…central Valencia is the place to go to fulfill all artistic interests. Another distinctive feature of the centre is the pedestrianised streets. It is possible to walk in the most commercial areas such as Calle Ribera or to wander to Ruzafa without having to worry about cars, but as we near the oldest part of the city there are a great deal more pedestrianised areas such as Plaza de la Virgen, Plaza Redonda, and a number of alleyways throughout Barrio del Carmen. During Las Fallas, Valencia’s biggest event, the centre is the place to be. Furthermore, as well as the aforementioned mascletà in the Plaza del Ayuntamiento, this area hosts a high number of the Fallas events. In order to see the biggest statues (fallas), it is a good idea to follow a tourist route in the centre as the majority of the special fallas and various other important Fallas events are situated in Ciutat Vella, Ensanche, and Ruzafa. For example, in Ruzafa there is a tradition of lighting the streets to astounding levels at night. Browse Valencia centre property for sale listings.